Far Cry 5 is not what I expected. 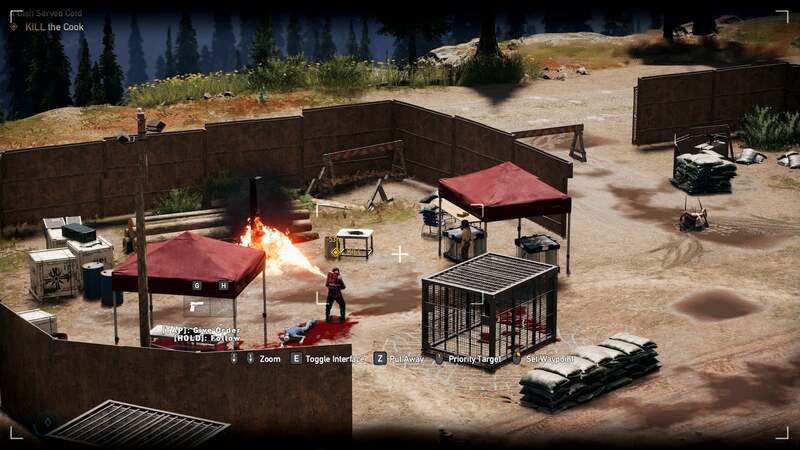 Far Cry 5 is also exactly what I expected. That conflict is the core of my thoughts, after spending more than three hours of hands-on time with the game recently. Far Cry 5’s first trailer made it seem like a hard-hitting commentary on American society, on aspects of religion and gun control and politics and all sorts of other weighty topics. That game? Nowhere to be found in Far Cry 5 as it stands now. Thus, not what I expected. And yet what’s left is very much Far Cry 5 ($60 preorder on Amazon), the sequel to Far Cry 4 and Far Cry 3 before that. The scenery’s changed to craggy Montana mountains, evergreen forests and elk, but otherwise this is another same-y iteration of a game I’ve played multiple iterations of. Exactly what I expected. I’m not sure how I feel about that duality yet, and probably won’t know until I’ve finished the game and written a full review. For now I have some thoughts though. Far Cry 5 starts much the same as its predecessors: With a disaster. In this case, you play as a police officer, a rookie who everyone just calls...“Rookie.” Seriously, I don’t think you even have a name in this game, and—even more weird—you don’t have a voice either. You can play as either a man or woman, and I guess with that decision came the decision to make the main character a blank slate. It's an odd decision given how central the player character was to Far Cry 4 in particular. There, the slow unraveling of protagonist Ajay Ghale’s story, the relationship between his mother and antagonist Pagan Min, was at the heart of the entire conflict. In Far Cry 5 you’re just a mute action hero who happens to fall into bad circumstances. But uh, you can play dress-up this time. That’s fun. 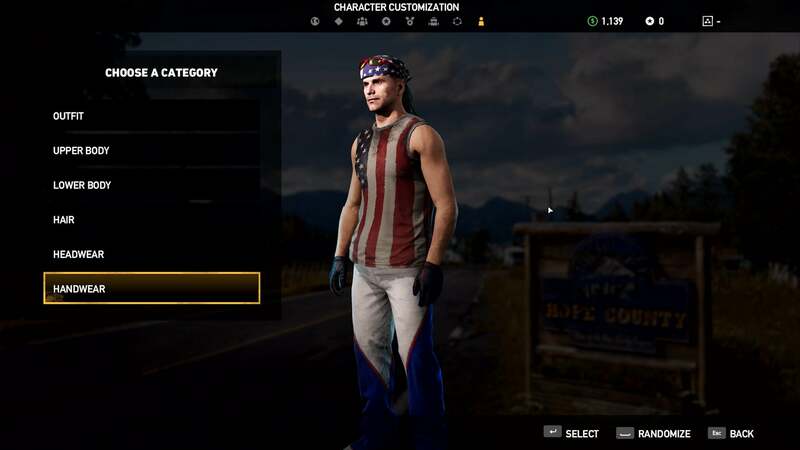 I made the most All-American Man I could, complete with mullet and full American flag themed outfit. Anyway, you begin the game trying to capture Joseph Seed, patriarch of the Seed family and head of Eden’s Gate, a cultish religious group in rural Montana. A U.S. Federal Marshall thinks he can arrest Seed, and despite all the protestations of local law enforcement (your boss) he marches into Seed’s compound, throws him in handcuffs, and starts to march him back to the helicopter. Did I mention all of Seed’s cultists are heavily armed? Things play out about as you’d expect, with this modern-day Branch Davidian compound turning lit tinderbox. Someone shoots a rocket at your helicopter, it crashes, Seed delivers some corny monologue about how God saved him, his followers chase you through the woods, and voila—you’re stranded in Montana. From there you’re rescued by an old man named Dutch, who enlists you to help out the local resistance groups, at which point you embark on your lonesome crusade against Seed and his lieutenants. Or maybe your three-person crusade. That’s the biggest change this time around, the increased presence of companion characters. 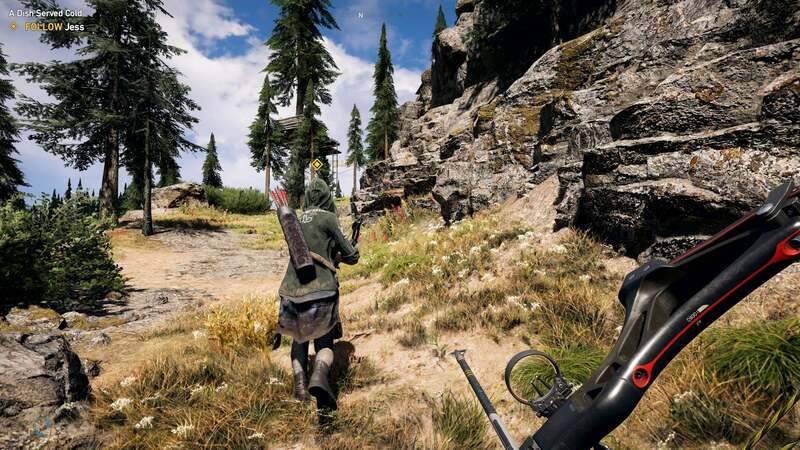 Ubisoft’s been highlighting many of these in trailer spots for months, so I won’t delve into it too much, but the short of it is at any moment you can roll as a three-person crew through Montana. These characters are about as tonally inconsistent as the rest of Far Cry 5. One, a solemn bow-wielding hunter named Jess, talked at length about how the cultists burned her friends alive in front of her. Meanwhile, my other companion at the time was Cheeseburger, a trained bear. Again, that’s a grizzly bear named Cheeseburger. It also looks like there’s a mountain lion you can recruit. It’s...well, Far Cry. It’s hard not to feel a bit of weariness at the prospect of doing this all over again—the dozens of enemy outposts, the quirky characters, the cinematic story missions that nevertheless don’t seem like they have much to say about anything. In Far Cry 3 it was novel. In Far Cry 4 it was improved. By Far Cry Primal I was tired. Far Cry 5 adopting the same tone, hitting the same story beats, feels like it could be one outing too many. I think that’s what intrigued me about the early prospect of Far-Cry-5-as-social-commentary. By striking a more serious pose, it felt like the series might break out of the rut it’s slipped into, or at least provide a better framework for all the chaos and wanton destruction. But no, Far Cry 5 plays it almost painfully safe, at least in what I’ve seen. Adding companions leads to more chaos and wanton destruction, but not necessarily different chaos and wanton destruction. You can also play the entire game in co-op now, which helps smooth out some of the rough edges by just making you ignore the rough edges entirely. 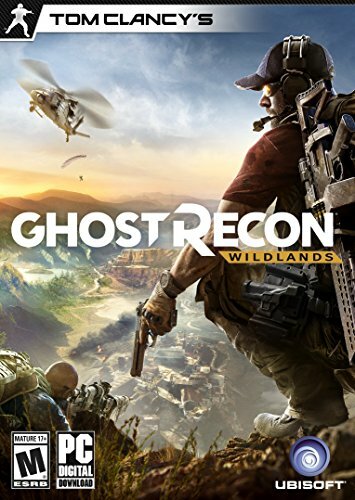 See also: Ghost Recon: Wildlands. Still, there’s an appeal to the chaos itself. That part hasn’t changed, and Montana is a solid backdrop for the usual Far Cry escapades. It’s rather mindless, but I still enjoyed scoping out an outpost, sneaking up on the enemies I could reach and shooting the ones I couldn’t with a crossbow. That “No Alarm” reward at the end always feels rewarding. Losing control can be great too, when the simulation takes advantage of a minor mistake to make your life hell. Maybe an animal appears as you’re stealthily approaching some enemies, forcing you into action. Or maybe the “tiny” fire you started expands into a roaring maelstrom, blazing a path through the dry forest. It’s the quiet moments I enjoyed most, though. 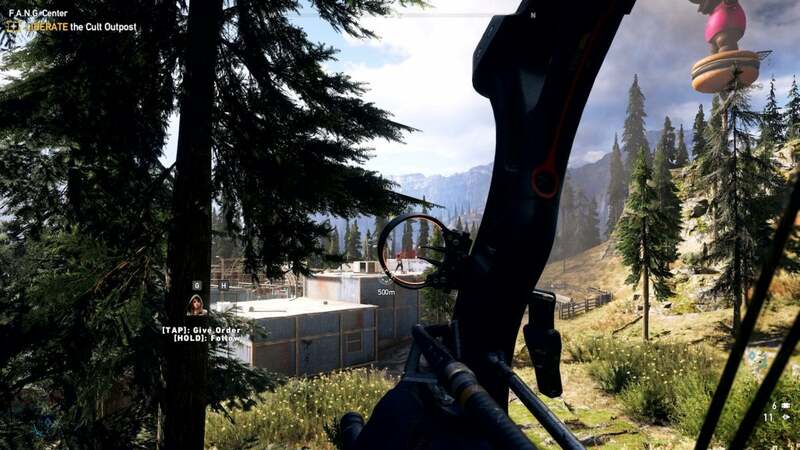 In fact, my favorite aspect of the demo was just existing in Ubisoft’s wilderness. 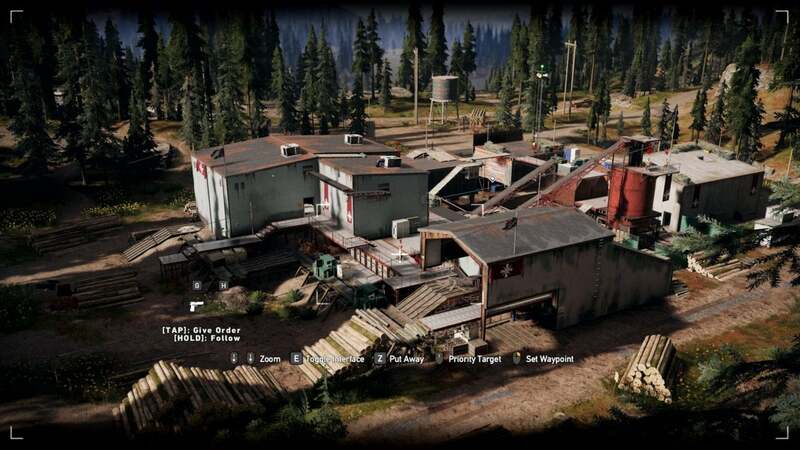 The early parts of Far Cry 5 take place on Dutch’s Island, a sort-of self-contained tutorial zone at the heart of the map. There are a handful of enemies patrolling, a few missions to complete, and even a small-scale outpost to conquer. Peaceful out here. I mean, if you ignore the angry cultists and that giant “Christ the Redeemer”-style statue on the horizon. But I spent a long time just walking around the island. Going nowhere in particular, just enjoying the stillness of the early morning, the fog creeping off the lake, the sound of my feet on pine needles. It’s a unique type of world-building, the quiet rural regions Far Cry focuses on, and Far Cry 5 is unparalleled in that respect, especially running at 4K with all the bells and whistles. There are so many interesting nooks to explore, from an abandoned ranger station to a conspicuous fire lookout tower to the small docks and shacks that line the lakefront. And in between? Miles of solemn forest, babbling brooks, craggy mountains, empty pastures. I think I enjoy that attention to mundane detail as much if not more than the parts where you blow it all up. Once again, I find myself admiring Ubisoft’s art department, its level designers, and so on, while also feeling like the game wrapped around those bones might need freshening up. With Far Cry 5 I hoped for an Assassin’s Creed: Origins, a game that reexamined one of Ubisoft’s most popular series and tried to shake the malaise. Instead it seems like we’re in store for the equivalent of an Assassin’s Creed: Syndicate—same ideas as before, but different skin. 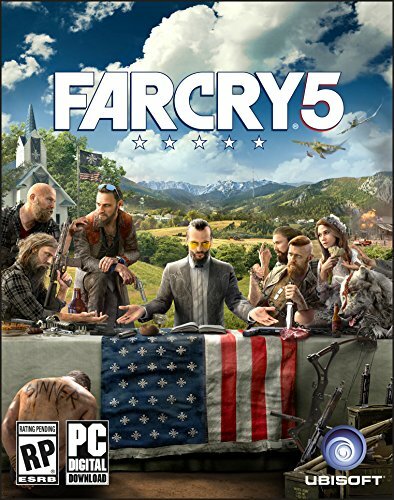 Far Cry 5 ($60 preorder on Amazon) is eminently playable, and I expect I’ll have a fair amount of fun with it. For some of you, that’s all that matters, and some of you probably think that’s the only thing that should matter. “It’s video games, right?” You’re not wrong, but I’ve already played this video game. Multiple times now. I even complained about a feeling of deja vu while reviewing Far Cry 4, two Far Crys ago. I called it “fantastic, but familiar,” as it retread Far Cry 3 almost beat for beat. 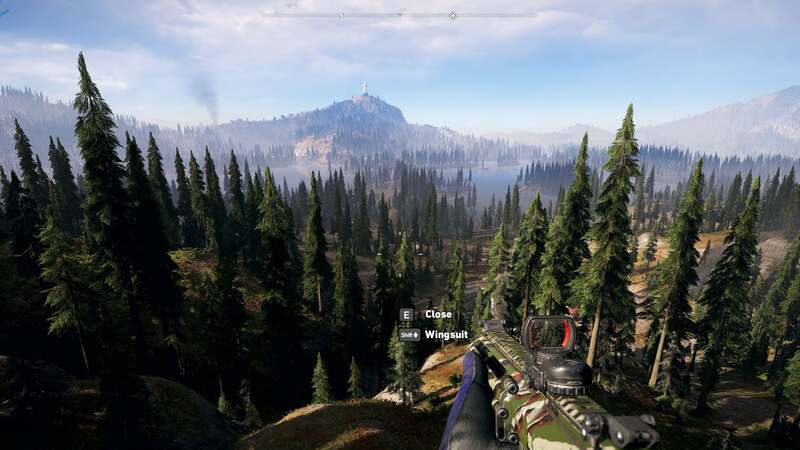 Far Cry 5’s changed some small factors—hunting is minimized and only used for money now, tower climbing takes a backseat, companions can be fun—but I can’t shake the feeling it’s more of the same. And that’s fine, but it’s a (pardon the pun) far cry from the Far Cry 5 I thought we were getting, which seemed like it would make up for mechanical similarities with a story that packed some punch. Maybe that’s still the case. It’s hard to tell from a three hour demo of a 30 hour game. But...well, there’s a bear named Cheeseburger. A bit hard to hope for any reasoned social commentary under those circumstances.